Diving instruction has standards, qualifications, materials, governing bodies and best practices. So why do we see such poor examples of diving practice? Why do so many new divers struggle with the basic skills? Why do tech divers forget some key techniques? Is it poor instruction or something else? At least six of DAN's Ten Most-Wanted Improvements in Scuba Diving (see sidebar) are covered in every entry level diving course, but the problems still occur. 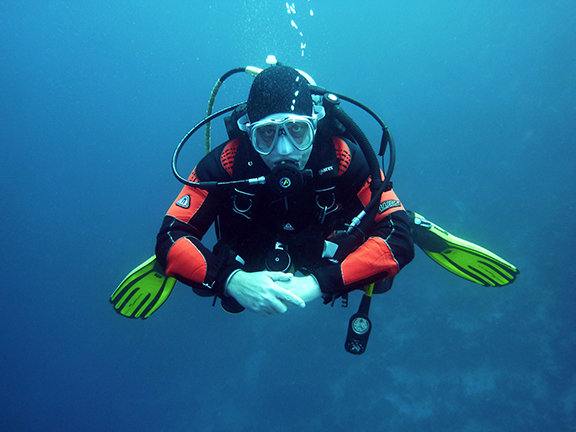 Greater buoyancy control is one of the items on DAN’s list of the 10 Most-Wanted Improvements in Scuba Diving. Why are students not learning this stuff in their scuba classes? The reality is that instructors do teach it, but the students are not learning it, or at least they are not putting what is taught into practice. There is a fundamental problem, and when there is a fundamental problem, we usually need to go back to basics. The first definition seems suitable for an academic subject, or a situation in which one needs to pass an exam but does not seem appropriate for diving, which is a more practical activity. The second definition seems better, as it refers to skills. This is a fundamental problem with most scuba training. We do not look for permanent change. If the student can perform the skill right now, then we tick off that skill on a checklist and move on to the next. There is no consideration as to whether the student will be able to perform the skill in a week, or a month, or under stressful situations. This is a critical aspect, but one we will have to return to in a later article. The second aspect of the definition calls for an “observable change in behaviour.” It is critical that we understand what change in behaviour we are looking for. If we do not know what change we are looking for, how will we know if we achieve it? However, many instructors believe (or have been taught) that teaching involves following a process. If they follow the correct process, then they have taught the student. That may be true; they may have taught, but it does not mean the student has learnt. I have often seen instructors become frustrated because their students “just don’t get it.” When asked what they mean by “it,” the instructor struggles to answer. They may not be able to answer, but they are confident that they will recognise “it” when they see “it.” This is a one of the key mistakes in teaching. Without knowing exactly what you are trying to achieve, it is difficult to put a plan in place to achieve it. This is where the idea of a learning objective, or a learning outcome, comes from. The learning objective is the “observable change in behaviour” we are looking for. In other words, we start with the end in mind. Determine what change we are looking for, and then determine how we can achieve that change. A learning objective is a deceptively simple concept. We just need to come up with a specific testable change that we want to see. This is easy to say, but like many skills, it takes practice. Common mistakes made may include making the objective too general or impossible to test. Another common mistake is one in which the objective focuses on what the instructor will do, when it should focus on what the student will be able to do. This is better. The aims are focused on the student. But are these realistic objectives? Knowing all about decompression theory is a hugely ambitious goal, which would take years to achieve. This is just not feasible. Of course, most instructors would say that they did not mean “all about decompression theory.” They just meant “the relevant parts of decompression theory to the relevant level.” Which then begs the question: What are the relevant parts and what is the relevant level? We can be more specific by focusing on the second condition—that the objective should be testable. How will we test that the objective has been met? How will we prove that the behaviour has been achieved? We can do this by focusing on the actual change in behaviour that we want. “Knowing” is not a change in behaviour and is not a productive word to use in an objective. Equally, “understand,” “learn,” “respect” or “appreciate” are too vague to be used in an objective. These are internal mental states, whereas the objective should give the external behaviour, or action, we are looking for. Consequently, the objective should use an action or “doing” word, such as “explain,” “list,” “assemble,” “define,” “calculate,” “plan,” “analyse,” “describe,” etc. It is essential that we have a realistic expectation of the behaviour we want from the diver. Expecting the same proficiency in mask clearing from open water divers on their first pool sessions versus their last open water dives is unrealistic, as is expecting the same level of proficiency of an open water diver and a divemaster candidate.